For both the swing state polls and the national polls to be right, something else has to give to make the math work. If Mr. Obama is performing well in swing states, but is only tied in the popular vote nationally, that means he must be underperforming in noncompetitive states. But polls of noncompetitive states don’t always cooperate with the story. Take the polls that were out on Tuesday. Mr. Obama trailed by “only” eight points, for instance, in a poll of Georgia that was released on Tuesday. Those are somewhat worse results than Mr. Obama achieved in 2008, when he lost Georgia by five percentage points. But they’re only a little bit worse, whereas the national polls are suggestive of a larger decline for Mr. Obama in the popular vote. Or take the poll of Texas, also out on Tuesday, which had Mr. Obama behind by 16 points there. He’s obviously no threat to win the state or come close to it, but that still represents only a 4-point decline for Mr. Obama from 2008, when he lost Texas by 12 points instead. High-population red states like these, Texas and Georgia, are just the sort of places where Mr. Obama would need to lose a lot of ground in order to increase the likelihood of his winning the Electoral College while losing the popular vote. Perhaps Mr. Obama is underperforming in deeply blue states rather than deeply red ones? Sometimes you’ll get numbers that check out with this assumption: Mr. Obama did get some mediocre polling in Oregon on Tuesday, for instance. But he also got a poll showing him ahead by 23 points in California. Another survey on Tuesday gave him a 31-point lead in Massachusetts. Yes, I am deliberately cherry-picking a bit. But the discrepancy seems to hold if you look at the data in a more comprehensive way. Nor is it an unusual feature of the FiveThirtyEight model. Rather, pretty much every method for evaluating the election based on state polls seems to hint at a very slight popular vote lead for Mr. Obama, along with an Electoral College one. In the table below, I’ve listed the current forecasts at seven different Web sites that use state polls, sometimes along with a modicum of other information like a state’s past voting history, to produce predictions of the popular vote in each state. The first of these sites is FiveThirtyEight. The others, in the order that they’re listed in the table, are Electoral-Vote.com; Votamatic, by the Emory University political scientist Drew Linzer; HuffPost Pollster; Real Clear Politics; Talking Points Memo’s PollTracker; and the Princeton Election Consortium, which is run by Sam Wang, a neuroscientist at Princeton. These are pretty much all the sites I’m aware of that use state polling data in a systematic way. You can see that the various projections strongly agree with another, for the most part, in making “calls” about individual states. The only state where different sites show different candidates ahead right now is Florida, where Talking Points Memo gives Mr. Obama a nominal 0.2-percentage point lead while the others (including FiveThirtyEight) have Mr. Romney slightly up instead. There are also four states — New Hampshire, Iowa, Colorado and Virginia — in which some methods show an exactly tied race while others give Mr. Obama the lead. Although I hope that this chart serves as a useful reference point — and as a reminder that other data-driven sites that look at the polls with the same philosophy that FiveThirtyEight applies are achieving largely the same results — I’m more interested in looking at this data in a macroscopic way. Suppose, for example, that you take the consensus forecast in each state. (By “consensus” I just mean: the average of the different forecasts.) Then you weigh it based on what each state’s share of the overall turnout was in 2008, in order to produce an estimate of the national popular vote. Do the math, and you’ll find that this implies that Mr. Obama leads nationally by 1.9 percentage points — by no means a safe advantage, but still a better result for him than what the national polls suggest. What if turnout doesn’t look like it did in 2008? 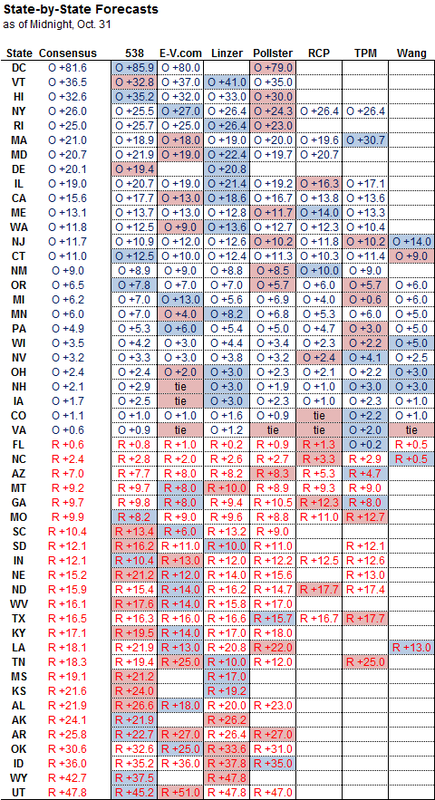 Instead, what if the share of the votes that each state contributed was the same as in 2004, a better Republican year? That doesn’t help to break the discord between state and national polls, unfortunately. Mr. Obama would lead by two percentage points in the consensus forecast weighing the states by their 2004 turnout. Or we can weigh the states by their turnout in 2010, a very good Republican year. But that doesn’t help, either: instead, Mr. Obama leads by 2.1 percentage points based on this method. Whether the state polls or the national polls characterize the election correctly could well determine its outcome. Mr. Obama’s lead in the Electoral College is modest, but also quite consistent across the different methods. The states in which every site has Mr. Obama leading make up 271 electoral votes — one more than the president needs to clinch victory. The states in which everyone has Mr. Romney ahead represent 206 electoral votes. That leaves five states, and 61 electoral votes, unaccounted for — but Mr. Obama would not need them if he prevails in the states where he is leading in the polls. But perhaps national polls tell the right story of the race instead — meaning that the state polls systematically overrate Mr. Obama’s standing? t build projections based on state polls — will not have a happy Nov. 6. With that said, our decision to cast our lot mostly with the state polls is not arbitrary. In recent years, they’ve been a slightly more unbiased indicator of how the election will play out. Bias, in a statistical sense, means missing consistently in one direction — for example, overrating the Republican’s performance across a number of different examples, or the Democrat’s. It is to be distinguished from the term accuracy, which refers to how close you come to the outcome in either direction. If our forecasts miss high on Mr. Obama’s vote share by 10 percentage points in Nevada, but miss low on it by 10 percentage points in Iowa, our forecasts won’t have been very accurate, but they also won’t have been biased since the misses were in opposite directions (they’ll just have been bad). This article also contained a comparison between state and national polls in the presidential race: which have been more free of bias? In recent elections — since state polling data became more robust — it’s the state polls that have done a bit better. This was especially so in 1996, when national polls implied a double-digit victory for Bill Clinton over Bob Dole (and Ross Perot) but state polls were more in line with the single-digit victory that he actually achieved. In 2000, state polls provided an accurate portrayal of a too-close-to-call race, while national polls missed high on George W. Bush vs. Al Gore. There have been other years like 1992 in which the national polls did a bit better. But on average since that year, the state polls have had a bias of 1.1 percentage points — half as much as the national polls, which have had a 2.1-point bias instead. But the historical evidence weighs in slightly more heavily on behalf of the state polls, in my view, when they seem to contradict the national ones. If the state polls are right, than Mr. Obama is not just the favorite in the Electoral College but probably also in the popular vote. Mr. Obama made gains in the FiveThirtyEight forecast on Tuesday, with his chances of winning the Electoral College increasing to 77.4 percent. Another poll that received a lot of attention on Tuesday was one by Glangariff Group Inc. in Michigan, for The Detroit News. That survey had Mr. Obama ahead by only 2.7 points in Michigan. There has been some odd polling in Michigan this year, but the Detroit News polls have not been a big part of the problem. Instead, its surveys have usually come pretty close to the polling consensus in the state. Furthermore, this survey suggests tightening in the race in Michigan since earlier this month, when a poll by the same firm had Mr. Obama ahead by 6.7 percentage points instead. 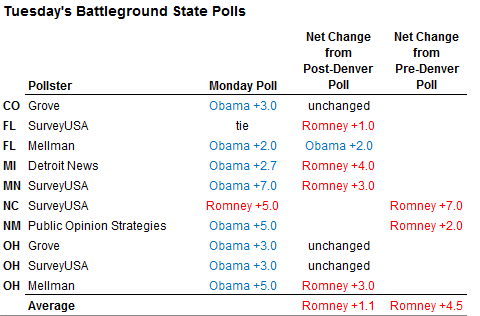 Nonetheless, Michigan is probably not as close as two or three points right now: most polls released after the first debate in Denver suggested a lead for Mr. Obama in the mid-to-high single digits. Usually, states do not shift all that much relative to others in their region. The fact that Mr. Obama’s polling has held up reasonably well in Ohio and Iowa, for example, is reason to suspect that some of the movement in the poll represents statistical noise, even if it comes from a good polling company. Perhaps more important, we’re at the stage in the race where getting a relatively good poll does not matter all that much: the question is which candidate is ahead outright in enough states to secure 270 electoral votes. Michigan deserves to be monitored over the final week of the campaign, but in all probability Mr. Romney’s more likely paths to victory will run through Ohio instead. Mr. Obama had a somewhat above-average day in national polls on Tuesday, which had him up in the race by about one percentage point on average. Part of this is because the Gallup poll, which has shown very poor results for Mr. Obama, did not publish results on account of Hurricane Sandy. 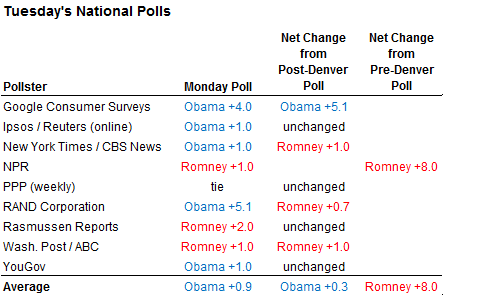 roughly 1-point deficit for Mr. Obama in their prior survey last week. In the meantime, the state polls continue to hint that Mr. Obama remains the favorite to win the Electoral College — and if the state polls are right, he may well be the favorite in the popular vote as well.